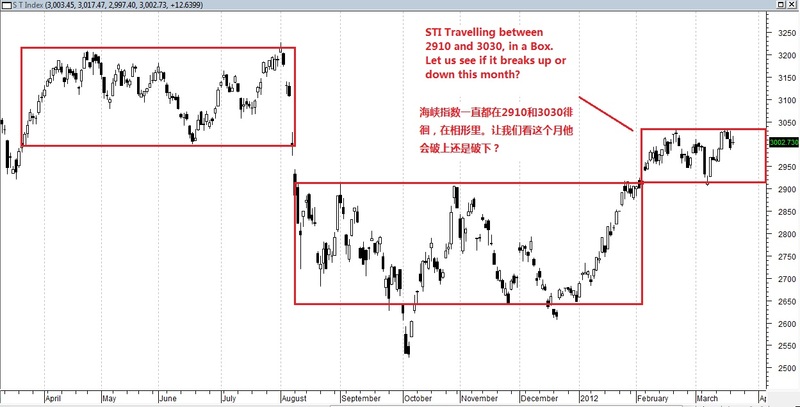 Daniel Loh: STI: Will it break up of 3030 or break down of 2910? STI: Will it break up of 3030 or break down of 2910? I have mentioned that it isn't easy trading the market in March mainly because it is like a sideway month to trade as I have explained in my article at the beginning of the month. I still do not expect Dow Jones to go up a lot like 500 points though we have a good Jobs report this month. For Singapore stocks, I think it seems like a tougher market as STI struggles to stand above 3000 points firmly. After it exceeds, it begins to drop after a few days. This is never a sign of firmness. It has been in a Box Pattern fluctuating between 2910 and 3030 for the past one and the half months. 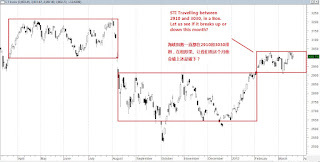 This is a sign of consolidation in a tight Box Pattern as shown in the charts. We shall see whether it breaks up of 3030 or breaks down of 2910. This month is coming to an end next week. Let us see if we get an answer by this week? If not, I think we may have the answer by end of next week. Like what I emphasize in the beginning of the month. I hope that this run will continue, but eventually it will end. I hope that it ends in a peaceful way instead of a big drop. Hence, I would rather there be a small correction instead of a big one. The longer the run, the harder it falls. If next month employment reports cannot meet the expectations after good reports all these months, this might be the consolidation that I am seeking. Before the next run-up again.